As a full service grocery and food store, Strack & Van Til needs your opinions to change and improve. 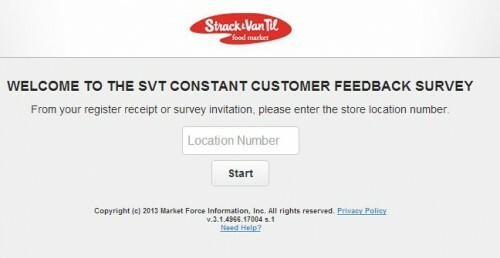 Its Strack & Van Til Customer Feedback Survey is online and waits for your participation. Share your shopping experience and tell the store what they could do better. Your precious feedback is the key to creating the best shopping experience. Enter the 4-digit store location number from your receipt to enter the survey. Answer some questions about your recent visit to Strack & Van Til. Strack & Van Til is a chain of grocery store with 38 locations in Northwest Indiana and the Chicago area. It attracts customers with fresh, quality food, a clean, safe shopping environment and helpful, knowledgeable associates. It insures customers the products at the best value. Its dedication and effort since 1960 lead to its success of today as the largest independent chain in Northwest Indiana. Stopped by the 61st street store. I purchased a few items along with avocados that rang up wrong. Took them to CS to correct the error. Even had an employee confirm the price. CS insisted the price on the receipt was correct and that there were 2 different ones. Although there was one sign clearly posted in the bin. I cancelled my entire order it took 3 ppl and more than 45 minutes to complete the transaction. I no longer shop In this store. Store 8793 has excellent service, pleasant checkers and great prices. Always excellent service and great prices. Ron at store #8749 is always so friendly. It’s nice to be recognized, and treated like an old friend. He is always polite and helpful. You need more cashiers like him. Great place to shop!!! Always ready to help…just like tonight…Jennifer S went the extra mile for me to find the oberweis eggnog!!! Yesterday afternoon my wife and I waited at the deli almost twenty minutes before being helped. there were only two employees serving customers. This was not the first time this has happened. This occurred at the Portage Stracks. I told Mike (store manager) about this incident, and he left in the direction of the deli. At store 8750. On November 23rd, Cashier Carmelita rang up my groceries. She told me the amount that I owed, and I gave her cash, which seemed like it was just printed. They were so new that they were stuck together. I had a hard time with it, I told her that she needed to recount it so it wasn’t short. She recounted and I wasn’t paying attention and she gave me a $20 back, there was $80 there instead of $60, I over payed her $20 dollars. She could of pocketed it, but she didn’t, she was honest. I was so impressed and very grateful. Keep up the good work. And thanks again! I like Stracks in Rennselaer a lot. Love the deli and seating area. Employees are the bomb. Wonderful time at 8749. Matthew is quiet but a great employee. Go Team. Jacob R make my food fresh with out giving me an attitude. The food was delicious! D Andre and Yousef were very Pleasant to check out with. Veronica was fabulous in deli!! Great Service & work store , 8768 ! Im so glad that strack & van til was able to stay open to keep blessing our communities with excellcent service , an food !! Keep up the Good work i have been very pleased. #8768 love how pleasant an mannerable the deli especially with a mostly woman staff an cashiers are. I even love night shift managers julie , an mickey. Amazing fresh scents in store as well. Store # 8768. I shop here a lot. Today I couldn’t find a couple things. George in produce helped me. He was very nice n polite. the lady at the seafood counter went out of her way to make sure i was able to get exactly what i was shopping for. i always come to the store in hammond (# 8770), and everyone always gives us excellent customer service, and i hope all the managers know what a great job all the employees do. Store 8747 Sandra J was so helpfull and sweet checking out w/ my 2 young grandsons. My grandsons even thought she was special! Kaylee in the cheese department convinced me to purchase a cheese I ended up loving! Could you please start getting Porcini mushrooms again? They are a vital part of a dish I make. YOUR CHECK OUT LADY, AT STORE 8782 HER NAME DENISE A WAS VERY LIKEABLE AND HELPFUL. I like your store and I like your products. Love that Strack’s is a full service store. I love the addition of instacart. I love the ready to heat meals–your chicken and shrimp meals are very good. your service is very good–today’s associate was Robin–very friendly and helpful. KEEP UP THE GOOD WORK!! Diann was a great cashier at the Chesterton store. Diann was a friendly,efficient cashier. The Merrillville store is terrible! The customer service is some of the worst I have experienced my 62/years. The only time when Service is decent is when Jeff McCall is there. When he is not there the employees run amock. The deli is worst than terribly when it comes to customer service. The employees do not want to go the extra mile and have no enthusiasm to service customers. They will see customers standing there and continue to everything but wait on customers. No smiles, no positive body language just deplorable! The seafood counter a little better but not enough help and the folks at the deli wouldn’t think of coming over to help if they are backed up. I am frankly looking to go to another store. Terrible shopping experience this past year. The store on Taft was much better. Also,long lines at cashier with no reaction to open up additional lanes especially if Jeff McCall is not there. Finally, the store is not kept clean! Just a terrible experience, hate it! I shopped this location and was extremely unsatisfied with the customer service I received from Star S. there was no greeting or acknowledgment and she mumbled under her breathe about the receipt taking to long to print. On top of all that I brought my own bags and she didn’t even apply that credit to my order and did not offer to assist with bagging my groceries. I made sure to call and speak to a manager to let them know about my poor shopping experience. Hope Shannon speaks to this employee that this service should not happen. Donna H was great and Doren was great with my bags!!! !